It was the decision day for us. We were only separated with 1 point from Paul and on a draw with Chris, how cool a racing day this would be! But the weather gods decided the decision was made and it rained and t-stormed all day. So at 15h the decision was made: no more racing. 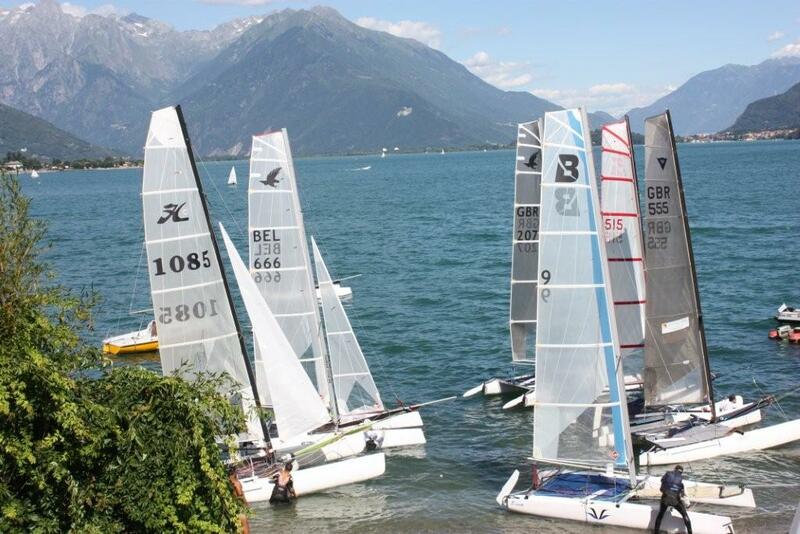 So there it was, the F16 Europeans ended with a non sailing day. But we do not complain, we had a fantastic week, with really the best sailing we ever had. Such a great scenery, nice weather, 12 races, sun, great people to hang out with. It was all marvelous! The club organised a perfect regatta and it ended with a perfect price giving with prizes and food and drinks, offered by their sponsor, Ferrari. The winners of this event are the very young Australian "kids": Jason Waterhouse & his crew Lisa. Congratulations! Full results on the F16 website. Stay tuned for a picture and video blog, following soon! Day 4 started of with no wind, a very quiet sunny day. The locals didn't really know what to expect. Would the wind kick in at 13h? Or would it be a no wind day? If the locals don't have a clue, it is really hard to decide what to do! So we set the boat up for a very light day, mast and jib were all rigged for little wind. At 12h everyone started to drift away to the course side, daring to hope for some more wind to race. At 13h we crossed the start line and so did the wind! There she was, blowing in all force, probably 20 knots. Haha that wind can fool you. So there we were, all rigged up for light wind and it was blowing. We were heavily overpowered. Gill had to put in all his effort just to steer (we had a very heavy helm due to the wrong mast setting) and he was beat just after race 1. We finished 10th, and were not happy about that. In between race 1 and 2 we adjusted the settings for the heavier wind (jib and mast settings). We hit the starting line for the 2nd time that day and where was the wind??? Hmmm okay so now the wind was gone, well not gone, but still a fair bit lesser than race 1. Cracks you up heh? So we were not overpowered, and luckily we managed to sail well and we ended up 6th, before Paul & Ann but behind Cris Sproat. Race 3 had almost the same wind as race 2, but a bit more shifty. We played it well and managed to get an 8th for the last race, in a tight duel at the gate with the Viper Dutch Boys Thijs Visser. We finished just before Paul did, but after Chris again (he really found his groove on day 4!). This day ended perfectly with a barbeque with some of the sailors at their appartment. To make it perfect we even had a T-Storm and some rain, but luckily their terrace had a covered top so we could stay outside to enjoy the lightning over the mountains. Day 3 is over and we made it again :-) It was a lighter day today but very exciting. We did very very bad in race 2, finishing 11th. Boehoe. We had a bad start in that race, due to this bad start we didn't have clean air on the left side of the course, so we decided to tack and found ourselves without pressure in the middle of the course. To top it all of we managed to over sail the gate in the last lap and then there was a kite surfer in the way so we had to douse the kite before the gate, so yeah, not a good race at all. So that will be one of our throw outs. We are currently in a draw for 7th place with Paul and Anne, who are also sailing a Falcon, so that is really great and also very exciting for the next races. Race 1 was our best race today, were we scored a 6. We had a clean high start and we were able to tack away quick to the right side of the course and that did pay off. We were 3rd at the upwind mark, but then we lost 1 place in the downwind run and than another 2 in the upwind mark (we over sailed the upwind mark a bit). Race 3 we scored a 7, so also very happy about that. We had great pressure going downwind with the kite (Kathleen had to sit in, because there was not enough wind to trap out) and we had alot of speed and depth. Day 2 is over and it was perfect. A bit more wind than yesterday for all 3 races. Very close rasing, closer than yesterday. It was very exciting. 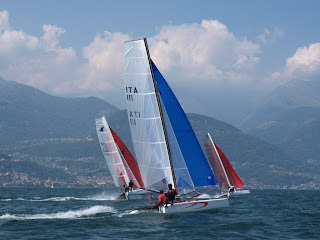 And the downwind races were so fast, whow! We loved it. But now I (Kathleen) am totally knackered. I feel my arms! We managed to get in the top 5 today with our last race, a 4!! Paul and Ann were flying on their Falcon, they scored an 8, a 3 and another 3, great! There were some protests and some OCS, so could be the scoring changes a bit. 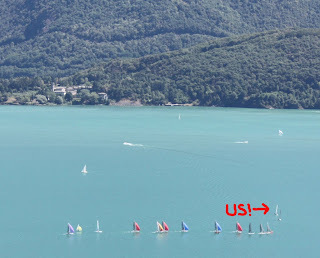 We had again 3 races, but the course was a bit smaller, so it all went a bit faster. Our downwind speed was great and we were overtaking boats, sailing deeper and faster. Now off to eat something, bon appetito! Day 1. Skippers meeting at 11 and the race course gets announced: 3 laps, upwind mark - spreader mark - gate. Three races are scheduled for today and for all the 5 days of the week. Still no wind, but weather prediction is that winds of 15 knots will kick in. 12h30 all 17 boats get on the water. By the time we got to the racing area the course is set. Great organisation and we start on time, 13h. The starts are tight but fair, no recalls, no Black Flags. We manage to get off the starting line very good each time. About 4rth to the committee boat and always with clean air. Shortly after the start everyone tacks to shore where the wind and the shifts are. Up to the shore it's a drag race. Once we did this we could keep up and even gain some boat lengths on the pro teams. On the upwind beat we tend to loose a place each time. After three laps we are about in 8th position to finish everytime. We'll change our mast settings just a bit to have a better upwind performance and to go for that top 5 today! Well we'll see how that turns out today! Sun, water, wind, nice sceneries. That is Como, Italy in a nutshell. 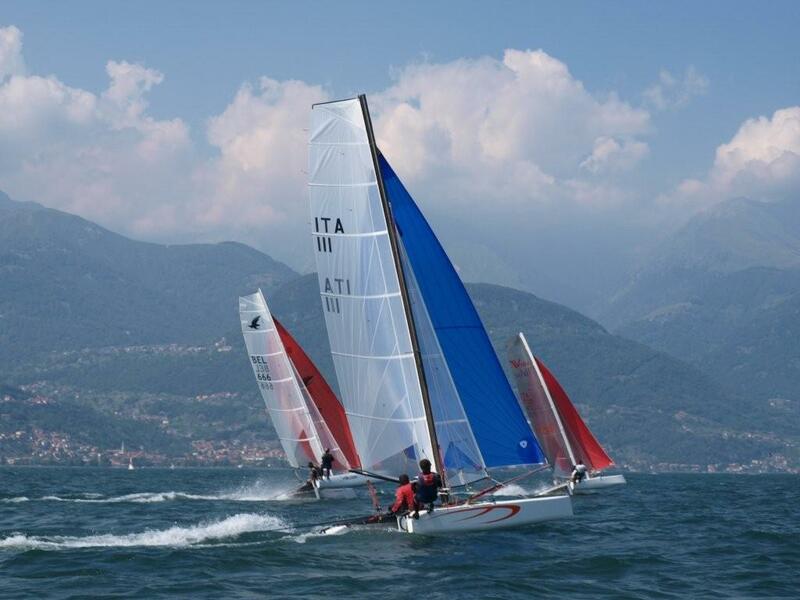 A great place for the first F16 Europeans. We arrived on Thursday, a few days before the actual regatta that starts on Monday. We had the boat measured on Friday morning. After that we set it up, adjusted some things we already wanted to do long time, but hadn't have the time for, and then set off for the first short sail. Damn, what a great lake! From 1 pm onwards the wind starts to blow Southernly (Nothernly in the morning) untill about 6 pm. When we went on the water it was about 15 knots and a great ride with the spinnaker. Same thing on Saturday! That looked promising for the rest of the week and the championship! Saturday most of the teams arrived and we could meet up with some familiar faces we hadn't seen for a long time. Today we did our first race, the practice race. In fact it was held together with a local regatta. 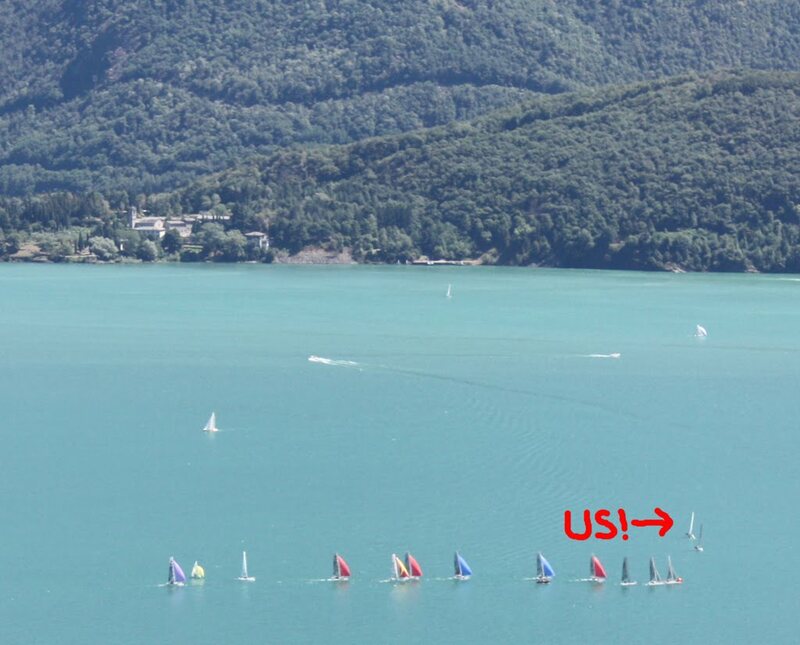 2 small races were done today, with only 5 boats on the starting line the first race. Us and 4 Viper teams. The wind was blowing Northernly the whole day because a storm hit us last night and this caused very shifty wind and a lot of dead spots during the race. This race we finished 4rth, with Darren Bundock and Carolijn Brouwer having a huge lead of the rest of us. The second race of the day most of the F16's were out on the water. (I think we are about 17 in total). We positioned quite late for the start, but found a hole 4 boats from the committee boat. We had a great start and got clean air immediately. We tacked quite early and got a great shift on that tack. The whole fleet turned to early to the upwind mark and had to do 2 more tacks, while we sailed into more wind by going further. This got us first to the upwind mark. We could keep our position up to the downwind mark as we did a great thing looking for pressure again. We continued to keep our lead second time at the upwind mark, but a group of 5 boats had gained a bit on us. On the second downwind we made the mistake on to gybe immediately into the pressure and got caught in a deadspot 50 meters below the upwind buoy! We didn't manage to do another race as the wind totally died and everyone headed back to the club. Well great first day for us, but I'm sure we'll have to be at our very best from start to finish if we want to be at the top of the fleet. Check our our website for more pictures the coming days.